Wonder what the blue book is on this. 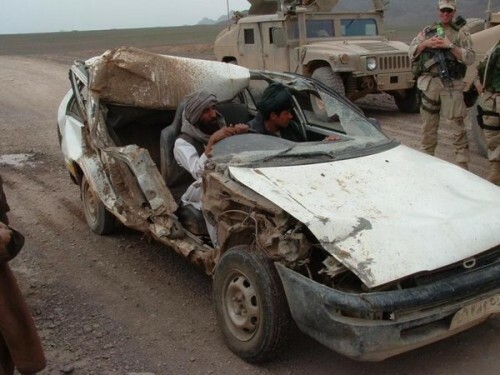 Must be a refurbished suicide bomber car. If it runs and has a radio, I’ll buy it! The driver likes to yell, ‘yabba dabba doo!’ before pedaling this car out on the road. Driver: Ala dammit, my check engine light just came on, I wont be able to pass my inspection. Passenger: Should we take it to the mechanic? Driver: No, i think i’ll just take the fuse for the light out, everything else should be fine. In the iraq blue book its’ value is three goats and your second oldest daughter.